HABIT: Insignificant flowers, followed by very decorative pale tan seedpods. Can tolerate morning sun. Looks like dwarf bamboo. CULTURE: Easy to grow in any soil in shady areas. In large areas, sow ½-2 lbs. seed per thousand square feet. 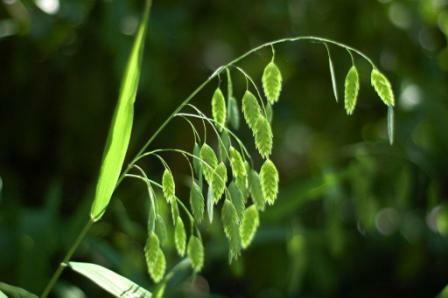 Stems with dry seed heads can be cut for long lasting dry flower arrangements. Cutting the seed heads off before they mature helps to prevent spreading. USES: Great plant for erosion control in the shade. Can also adapt to sunny spots. PROBLEMS: Spreads aggressively by seed and rhizomes, so be careful where you plant it.